Martindale's Language Center - Indigenous Languages of Australia: Dictionaries, Courses, Text-to-Speech, Grammar, Writing, Keyboards, TTS, Speech Synthesizer, Speech Synthesis, etc. Official Language of the Aranda People (Tribe), Town of Alice Springs (Mparntwe), Northern Territory, Australia. Over "2,800" (Australian Bureau of Statistics Census - 2006 - Detailed in the "State of Indigenous Cultural Heritage 2011" - Released: December 2011 - Beginning on Page 99 - Department of Sustainability, Environment, Water, Population and Communities, Australian Government) Speakers in Australia. Language Programs for Adults & Children. Eastern Arrernte Courses, Lessons, etc. ARRERNTE, EASTERN VACABULARY LESSONS (WAV OR MP3) - Various Speakers, Northern Territory, Australia; The UCLA Phonetics Lab Archive, University of California, Los Angeles, (UCLA) Multimedia Arrernte, Eastern Vocabulary Audio Lessons (Text, Images & Audio/Sound). Official Language of the Awabakal People, Australia. "AWABAKAL-ENGLISH" "ENGLISH-AWABAKAL" - AWABAKAL DICTIONARY - Author: David Andrew Roberts, School of Liberal Arts (School of Humanities and Social Science - 2010), Faculty of Education & Arts, University of Newcastle, Australia Multimedia Awabakal <> English - Awaba: A Database of Historical Materials Relating to the Aborigines of the Newcastle-Lake Macquarie Region (Text & Images). Official Language of the Bayungu People (Tribe), Cardabia Station & "Point Cloates through to Point Quobba, then stretches east to Manberry Station and north to Winning Pool Station", Pilbara Region, Western Australia (WA), Australia. Over "2" (Bayungu - The People and their Traditional Country - Wangka Maya Pilbara Aboriginal Language Centre) Speakers in Australia. "BAYUNGU-ENGLISH" "ENGLISH-BAYUNGU" - BAYUNGU DICTIONARY - Wangka Maya Pilbara Aboriginal Language Centre, South Hedland, Western Australia (WA), Australia Multimedia English <> Bayungu Dictionary - A Language of the Pilbara (Text & Images). Browse Down to the Bayungu and Click on "Interactive e-Dictionary"
Official Language of the Bilinarra People (Tribe), Pigeon Hole (Pigeon Hole Station) or Bunbidee, Victoria Daly Shire, Walangeri Ward, Northern Territory Government Bushtel Pigeon Hole, Northern Territory Government Bushtel. "BILINARRA-ENGLISH" "ENGLISH-BILINARRA" - BILINARRA TO ENGLISH DICTIONARY - Bilinarra Language: Bilinarra people 2013, Felicity Meakins (Compiler) 2013, Illustrations: Department of Land Resource Management, Catholic Education Office Kimberley Region, & the Diwurruwurru-jaru Aboriginal Corporation 2013; Compiler: Felicity Meakins; Linguistic Contributions from: Felicity Meakins, et al. ; Bilinarra Language Consultants: Anzac Mungayari Mungganyi Jangari, et al. ; Audio excerpts Created by: Shani Berriman, et al. ; Australian Society for Indigenous Languages (AUSIL, Darwin), 2013 Multimedia English <> Bilinarra Dictionary - Bilinarra to English Dictionary (Text, Images & Audio/Sound). "...It is a condition of use of this database that users ensure that any disclosure of the information contained in this catalogue is consistent with the views and sensitivities of Bilinarra people..."
Over "114" (Australian Bureau of Statistics Census - 2006 - Detailed in the "State of Indigenous Cultural Heritage 2011" - Released: December 2011 - Beginning on Page 99 - Department of Sustainability, Environment, Water, Population and Communities, Australian Government) Speakers in Australia. Official Language of the Burarra People (Tribe) & Gun-nartpa People (Tribe), Town of Maningrida, North-Central Arnhem Land and in the Blyth & Cadell River Regions, Northern Territory, Australia. Over "1,000" (Australian Bureau of Statistics Census - 2006 - Detailed in the "State of Indigenous Cultural Heritage 2011" - Released: December 2011 - Beginning on Page 99 - Department of Sustainability, Environment, Water, Population and Communities, Australian Government) Speakers in Australia. "BURARRA-ENGLISH" "ENGLISH-BURARRA" - BURARRA-ENGLISH INTERACTIVE DICTIONARY - Compilers: Kathleen Glasgow & David Glasgow; Series Editor: Charles E. Grimes; Editor: Maarten Lecompte; Publication: AuSIL Interactive Dictionary Series A-1; Copywright: Australian Society for Indigenous Languages (AuSIL), 2011 Multimedia English <> Burarra Dictionary - Burarra-English Interactive Dictionary (Text & Images). "...consists of approximately 4000 headwords collected by Kathleen and David Glasgow. The dictionary was previously published by the Summer Institute of Linguistics in 1994..."
BURARRA VACABULARY LESSONS (WAV OR MP3) - Speaker: Katy Fry, Gochanjinyjirra, Northern Territory, Australia; The UCLA Phonetics Lab Archive, University of California, Los Angeles, (UCLA) Multimedia Burarra Vocabulary Audio Lessons (Text, Images & Audio/Sound). "BURDUNA-ENGLISH" "ENGLIH-BURDUNA" - BURDUNA DICTIONARY - Wangka Maya Pilbara Aboriginal Language Centre, South Hedland, Western Australia (WA), Australia Multimedia English <> Burduna Dictionary - A Language of the Pilbara (Text & Images). Browse Down to the Burduna and Click on "Interactive e-Dictionary"
Over "300" Speakers in Australia. "ENGLISH-DJINANG" "DJINANG-ENGLISH" - DJINANG-ENGLISH INTERACTIVE DICTIONARY - Compiler: Bruce E. Waters; Series Editor: Charles E. Grimes; Editor: Maarten Lecompte; Publication: AuSIL Interactive Dictionary Series A-7; Copywright: Australian Society for Indigenous Languages (AuSIL), 2011 Multimedia English <> Djinang Dictionary - Djinang-English Interactive Dictionary (Text & Images). "...consists of approximately 3400 headwords and is based on fieldwork conducted by Bruce and Glenys Waters in the 1970s and 1980s, working under the auspices of SIL and previously published as an interim Djinang dictionary in 1983..."
Official Language of the Gamilaraay People, Northern New South Wales, Australia. "The Gamilaraay (Kamilaroi) Language, northern New South Wales - A Brief History of Research - Author: Peter K. Austin - The Hans Rausing Endangered Languages Project"
Over "50" Speakers in Australia. Language Programs for Adults & Children and Gamilaraay (Kamilaroi) Language Courses being taught in High Schools in Northern New South Wales. "The Gamilaraay (Kamilaroi) Language, northern New South Wales - A Brief History of Research - Author: Peter K. Austin - The Hans Rausing Endangered Languages Project"
GAYARRAGI, WINANGALI - Complied by: John Glacon & David Nathan (Department of Linguistics, School of Oriental and African Studies); and the Yuwaalaraay.org, Catholic Schools Office, Armidale, NSW, Australia Multimedia Gamilaraay Language & Yuwaalaraay Language Dictionary, etc. (Text & Images). "...an interactive multimedia resource for Gamilaraay and Yuwaalaraay, languages of northern New South Wales, Australia..."
"...is free for use by individuals and Gamilaraay Yuwaalaraay organisations..."
957 spoken sentences from traditional speakers, all transcribed, and hyperlinked to the dictionary; etc..."
Gamilaraay Courses, Lessons, etc. - Kamilaroi Courses, Lessons, etc. GAMILARAAY LESSONS - Yuwaalaraay.org, Catholic Schools Office, Armidale, NSW, Australia Multimedia Gamilaraay Audio Lessons (Text, Images & Audio/Sound). Gamilaraay Conversation Words & Phrases Audio Lessons; etc..."
Official Language of the Guugu Yimithirr People (Tribe), Hopevale, Queensland, Australia. Over "780" (Australian Bureau of Statistics Census - 2006 - Detailed in the "State of Indigenous Cultural Heritage 2011" - Released: December 2011 - Beginning on Page 99 - Department of Sustainability, Environment, Water, Population and Communities, Australian Government) Speakers in Australia. GUGUYIMIDJIR VACABULARY LESSONS (WAV OR MP3) - Speakers: Roger Hart & Ted Bowen, Hopevale, Queensland, Australia; The UCLA Phonetics Lab Archive, University of California, Los Angeles, (UCLA) Multimedia Guguyimidjir Vocabulary Audio Lessons (Text, Images & Audio/Sound). Over "200" (Gunyangara: East Arnhem Shire Council & the Gumatj Association) Speakers in Australia. 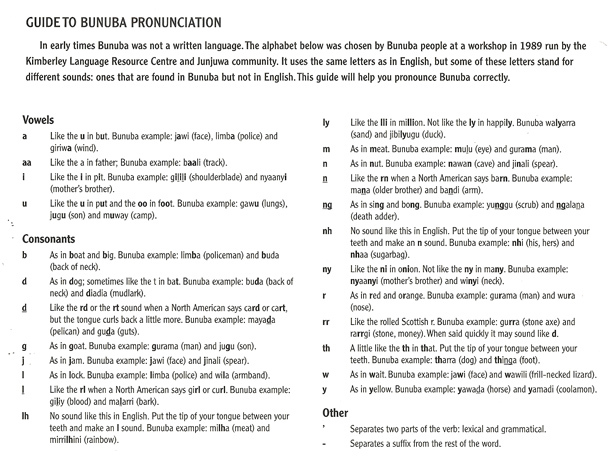 GUMATJ VACABULARY LESSONS (WAV OR MP3) - Speaker: Bakamana, Yirrkala, Northern Territory, Australia; The UCLA Phonetics Lab Archive, University of California, Los Angeles, (UCLA) Multimedia Gumatj Vocabulary Audio Lessons (Text, Images & Audio/Sound). Official Language of the Kunwinjku People, Gunbalanya Township, Kakadu National Park, Western Arnhem Land, Northern Territory, Australia. Over "900" (Australian Bureau of Statistics Census - 2006 - Detailed in the "State of Indigenous Cultural Heritage 2011" - Released: December 2011 - Beginning on Page 99 - Department of Sustainability, Environment, Water, Population and Communities, Australian Government) Speakers in Australia. Gunwinggu (Kunwinjku) Courses, Lessons, etc. GUNWINGGU VACABULARY LESSONS (WAV OR MP3) - Speaker: Hamish Kakkarrba, Maningrida, Australia; The UCLA Phonetics Lab Archive, University of California, Los Angeles, (UCLA) Multimedia Gunwinggu Vocabulary Audio Lessons (Text, Images & Audio/Sound). Official Language of the Gupapuyngu People (Tribe), Gapuwiyak, Galiwin'ku, Milingimbi & Ramingining Communities, Northeast Arnhem Land, Northern Territories, Australia. Over "320" (Australian Bureau of Statistics Census - 2006 - Detailed in the "State of Indigenous Cultural Heritage 2011" - Released: December 2011 - Beginning on Page 99 - Department of Sustainability, Environment, Water, Population and Communities, Australian Government) Speakers in Australia. "GUPAPUYŊU (GUPAPUYNGU)-ENGLISH" "ENGLISH-GUPAPUYŊU (GUPAPUYNGU)" - GUPAPUYNGU DICTIONARY - Aboriginal Resource and Development Services Inc. (ARDS), Darwin & Nhulunbuy, Australia Multimedia Gupapuyŋu (Gupapuyngu) <> English - Gupapuyŋu (Gupapuyngu) Dictionary (Text & Images). Click on Gupapyngu Dictionary (2.6MB Download)..."
"...one of a several Yolŋu (Yolngu) dialects currently spoken in the communities of Milingimbi, Ramingiṉing, Gapuwiyak and Galiwin’ku..."
Gupapuyngu Lessons, Courses, Literature, etc. Over "20" (Page 2 of the Research Report Bibliography: Red River - 2/2003 - Research Unit, National Native Title Tribunal, Commonwealth of Australia) Speakers in Australia. Gurdjar Courses, Lessons, etc. - Kurtjar Courses, Lessons, etc. GURDJAR VACABULARY LESSONS (WAV OR MP3) - Speakers: Rolly Gilbert & Toby 'He', Normanton, Queensland, Australia; The UCLA Phonetics Lab Archive, University of California, Los Angeles, (UCLA) Multimedia Gurdjar Vocabulary Audio Lessons (Text, Images & Audio/Sound). Over "590" (Australian Bureau of Statistics Census - 2006 - Detailed in the "State of Indigenous Cultural Heritage 2011" - Released: December 2011 - Beginning on Page 99 - Department of Sustainability, Environment, Water, Population and Communities, Australian Government) Speakers in Australia. "GURINDJI-ENGLISH" "ENGLISH-GURINDJI" - GURINDJI MULTIMEDIA DATABASE - Gurindji language: Gurindji people 2013, Database compilation: Felicity Meakins, Patrick McConvell, Erika Charola, Norm McNair, Helen McNair and Lauren Campbell 2013, Illustrations: Department of Land Resource Management, Catholic Education Office Kimberley Region, & the Diwurruwurru-jaru Aboriginal Corporation 2013; Compilers: Felicity Meakins, et al. ; Gurindji Language Consultants: Johnny Kijngayari Janam, et al. ; Audio excerpts were Created by: Jackie Van Den Bos, et al. ; Australian Society for Indigenous Languages (AUSIL, Darwin), 2013 Multimedia English <> Gurindji Dictionary - Gurindji Multimedia Database (Text, Images & Audio/Sound). "...It is a condition of use of this database that users ensure that any use of the information contained in this catalogue is consistent with the views and sensitivities of Gurindji people..."
Official Language of the Iwaidja People (Tribe), Croker Island & the Cobourg Peninsula, Western Amhemland, Northern Territory, Australia. Over "150" (Iwaidja-English Interactive Dictionary - Introduction - 2011) Speakers in Australia. "ENGLISH-IWAIDJA" "IWAIDJA-ENGLISH" - IWAIDJA-ENGLISH INTERACTIVE DICTIONARY - Compilers: Noreen Pym & Bonnie Larrimore; Series Editor: Charles E. Grimes; Editor: Maarten Lecompte; Publication: AuSIL Interactive Dictionary Series A-2; Copywright: Australian Society for Indigenous Languages (AuSIL), 2011 Multimedia English <> Iwaidja Dictionary - Iwaidja-English Interactive Dictionary (Text & Images). "...consists of approximately 1600 headwords collected on Croker Island between 1972 and 1979 by Noreen Pym and Bonnie Larrimore under the auspices of the SIL, Australia. Many Iwaidja speakers provided data..."
"...The interactive version is based on the revised 1982 draft that was eventually published as Pym and Larrimore (1998)..."
Official Language of the Jiwarli People (Tribe), "...located in the area between the towns of Carnarvon and Onslow, through to Geraldton in the south and Port Hedland in the north..." (Wangka Maya Pilbara Aboriginal Language Centre), Western Australia (WA), Australia. Number of Speakers: "...There are many people who are from Jiwarli heritage who speak a few words or phrases of the language..." (Wangka Maya Pilbara Aboriginal Language Centre). "JIWARLI-ENGLISH" "ENGLISH-JIWARLI" - JIWARLI DICTIONARY - Wangka Maya Pilbara Aboriginal Language Centre, South Hedland, Western Australia (WA), Australia Multimedia English <> Jiwarli Dictionary - A Language of the Pilbara (Text & Images). Browse Down to the Jiwarli and Click on "Interactive e-Dictionary". Official Language of the Kaytetye People (Tribe), Neutral Junction (Artarre), Stirling (Ilewarr), Ankweleyelengkwe and Barrow Creek, Central Land Council, Northern Territory, Australia. Aboriginal languages, People and Culture, Central Land Council or ..."Thangkenharenge Aboriginal Land Trust holds approximately 12.5 square kilometres of land land at Barrow Creek in trust for the Kaytetye people...(Agreements, Treaties and Negotiated Settlements database)"
Over "150" (Australian Institute for Aboriginal and Torres Strait Islander Studies) Speakers in Australia. Kaititj Courses, Lessons, etc. - Kaytetye Courses, Lessons, etc. KAITITJ VACABULARY LESSONS (WAV OR MP3) - Speaker: Stanley Tagal, North of Alice Springs, Northern Territory, Australia; The UCLA Phonetics Lab Archive, University of California, Los Angeles, (UCLA) Multimedia Kaititj Vocabulary Audio Lessons (Text, Images & Audio/Sound). Official Language of the Kalaw Lagaw Ya People (Tribe), Torres Strait Islands (Saibai Island, Badu Island, Mabuaiq Island, etc. ), Queensland, Australia. Over "1,200" (Australian Bureau of Statistics Census - 2006 - Detailed in the "State of Indigenous Cultural Heritage 2011" - Released: December 2011 - Beginning on Page 99 - Department of Sustainability, Environment, Water, Population and Communities, Australian Government) Speakers in Australia. Kala Lagaw Ya Lessons, Courses, etc. KALA LAGAW YA VACABULARY LESSONS (WAV OR MP3) - Speaker: Robinson Walit, Western Torres Strait Islands, Queensland, Australia; The UCLA Phonetics Lab Archive, University of California, Los Angeles, (UCLA) Multimedia Kala Lagaw Ya (Western Torres Strait) Vocabulary Audio Lessons (Text, Images & Audio/Sound). Official Language of the Karajarri People (Tribe), Bidyadanga Community, West Kimberley (Kimberley Land Council & the Karajarri Traditional Lands Association), Western Australia (WA), Australia. Over "15" (Wangka Maya Pilbara Aboriginal Language Centre) Speakers in Australia. "KARAJARRI-ENGLISH" "ENGLISH-KARAJARRI" - KARAJARRI DICTIONARY - Wangka Maya Pilbara Aboriginal Language Centre, South Hedland, Western Australia (WA), Australia Multimedia English <> Karajarri Dictionary - A Language of the Pilbara (Text & Images). Browse Down to the Karajarri and Click on "Dictionary e-Book"
Official Language of the Kartujarra People (Tribe), Parnngurr, Jigalong, Punmu and Parnpajinya Communities, Western Australia (WA), Australia. Approximately "5" (Wangka Maya Pilbara Aboriginal Language Centre) Speakers ("...who could still speak a pure form of the language..." in Australia. "KARTUJARRA-ENGLISH" "ENGLISH-KARTUJARRA" - KARTUJARRA DICTIONARY - Wangka Maya Pilbara Aboriginal Language Centre, South Hedland, Western Australia (WA), Australia Multimedia English <> Kartujarra Dictionary - A Language of the Pilbara (Text & Images). Browse Down to the Kartujarra and Click on "Dictionary e-Book"
Official Language of the Mangala People (Tribe), Kimberly Region, Western Australia (WA), Australia. "MANGALA-ENGLISH" "ENGLISH-MANGALA" - MANGALA DICTIONARY - Wangka Maya Pilbara Aboriginal Language Centre, South Hedland, Western Australia (WA), Australia Multimedia English <> Mangala Dictionary - A Language of the Pilbara (Text & Images). Browse Down to the Mangala and Click on "Interactive e-Dictionary"
Official Language of the Manyjilyjarra People (Tribe), Punmu, Kunuwarraji, Parnngurr, Jigalong and Parnpajinya Communities, Western Australia (WA), Australia. Over "300" (Wangka Maya Pilbara Aboriginal Language Centre) Speakers in Australia. "MANYJILYJARRA-ENGLISH" "ENGLISH-MANYJILYJARRA" - MANYJILYJARRA DICTIONARY - Wangka Maya Pilbara Aboriginal Language Centre, South Hedland, Western Australia (WA), Australia Multimedia English <> Manyjilyjarra Dictionary - A Language of the Pilbara (Text & Images). Browse Down to the Manyjilyjarra and Click on "Interactive e-Dictionary"
Official Language of the Martu People (Tribe), Jigalong, Parnngurr, Punmu, Newman, Nullagine, Port Hedland, Warralong, Strelley, etc. ), Western Australia (WA), Australia. Over "800" (Wangka Maya Pilbara Aboriginal Language Centre) Speakers in Australia. Language Programs for Adults & Children Jigalong Remote Community School. "MARTU WANGKA-ENGLISH" "ENGLISH-MARTU WANGKA" - MARTU WANGKA DICTIONARY - Wangka Maya Pilbara Aboriginal Language Centre, South Hedland, Western Australia (WA), Australia Multimedia English <> Martu Wangka Dictionary - A Language of the Pilbara (Text & Images). Browse Down to the Martu Wangka and Click on "Interactive e-Dictionary"
Over "300" (Maung-English Interactive Dictionary - Introduction - 2013) Speakers in Australia. "MAUNG-ENGLISH" "ENGLISH-MAUNG" - MAUNG-ENGLISH INTERACTIVE DICTIONARY - Compilers: Heather Hewett; Anne Dineen; David Stainsby and Robin Field; Series Editor: Charles E. Grimes; Editor: Maarten Lecompte; Publication: AuSIL Interactive Dictionary Series A-8; Australian Society for Indigenous Languages (AuSIL), 2013 Multimedia English <> Maung Dictionary - Maung-English Interactive Dictionary (Text & Images). "...consists of approximately 2500 headwords and is the electronic version of Hewett’s dictionary (1990) deposited with ASEDA..."
Official Language of Meriam Speakers on the Islands of Mer (Murray Island), Waier & Dauar, Erub (Daley Island), & Urgar (Stephens Island), in the Eastern Torres Strait, Queensland, Australia. Over "200" (Australian Bureau of Statistics Census - 2006 - Detailed in the "State of Indigenous Cultural Heritage 2011" - Released: December 2011 - Beginning on Page 99 - Department of Sustainability, Environment, Water, Population and Communities, Australian Government) Speakers in Australia. MERIAM VACABULARY LESSONS (WAV OR MP3) - Speaker: Mariot Marbo, Murray Island & Eastern Torres Strait Islands, Queensland, Australia; The UCLA Phonetics Lab Archive, University of California, Los Angeles, (UCLA) Multimedia Meriam Vocabulary Audio Lessons (Text, Images & Audio/Sound). Official Language of the Murrinh-Patha People (Tribe), Wadeye (Port Keats), Northern Territory, Australia. Over "1,800" (Australian Bureau of Statistics Census - 2006 - Detailed in the "State of Indigenous Cultural Heritage 2011" - Released: December 2011 - Beginning on Page 99 - Department of Sustainability, Environment, Water, Population and Communities, Australian Government) Speakers in Australia. MURRINH-PATHA VACABULARY LESSONS (WAV OR MP3) - Speaker: Gregory Panpawa Mollinjin, Wadeye (Port Keats), Northern Territory, Australia; The UCLA Phonetics Lab Archive, University of California, Los Angeles, (UCLA) Multimedia Murrinh-Patha Vocabulary Audio Lessons (Text, Images & Audio/Sound). Murrinh-Patha (Murriny Patha) Literature, Songs, etc. Official Language of the Ngan'gikurunggurr People (Tribe), Communities and/or outstations of Nauiyu, Peppimenarti, Wudigapildhiyerr, Nganambala, Merrepen, etc., Northern Territory, Australia. Over "180" (Australian Bureau of Statistics Census - 2006 - Detailed in the "State of Indigenous Cultural Heritage 2011" - Released: December 2011 - Beginning on Page 99 - Department of Sustainability, Environment, Water, Population and Communities, Australian Government) Speakers in Australia. Nangikurrunggurr Courses, Lessons, etc. - Ngan'gikurunggurr Courses, Lessons, etc. NANGIKURRUNGGURR VACABULARY LESSONS (WAV OR MP3) - Speaker: Charlie Ariyu Djulama, Daly River Mission, Northern Territory, Australia; The UCLA Phonetics Lab Archive, University of California, Los Angeles, (UCLA) Multimedia Nangikurrunggurr Vocabulary Audio Lessons (Text, Images & Audio/Sound). Official Language of the Ngadjonji People (Tribe), Atherton Tablelands, Eastern Highlands, Far North Queensland, Australia. Ngadjonji Dictionaries, Glossaries, Courses, Lessons, etc. Official Language of the Ngarluma People (Tribe), Town of Roebourne, West Pilbara Region, Western Australia (WA), Australia. Over "30" (Australian Bureau of Statistics Census - 2006 - Detailed in the "State of Indigenous Cultural Heritage 2011" - Released: December 2011 - Beginning on Page 99 - Department of Sustainability, Environment, Water, Population and Communities, Australian Government) Speakers in Australia. "NGARLUMA-ENGLISH" "ENGLISH-NGARLUMA" - NGARLUMA DICTIONARY - Wangka Maya Pilbara Aboriginal Language Centre, South Hedland, Western Australia (WA), Australia Multimedia English <> Ngarluma Dictionary - A Language of the Pilbara (Text & Images). Browse Down to the Ngarluma and Click on "Dictionary e-Book"
Official Language of the Nunggubuyu People (Tribe), Town of Numbulwar, Northern Territory, Australia. Over "100" (Australian Bureau of Statistics Census - 2006 - Detailed in the "State of Indigenous Cultural Heritage 2011" - Released: December 2011 - Beginning on Page 99 - Department of Sustainability, Environment, Water, Population and Communities, Australian Government) Speakers in Australia. NUNGGUBUYU VACABULARY LESSONS (WAV OR MP3) - Speaker: Didomain Uibo, Numbulwar & East Arnhem Land, Northern Territory, Australia; The UCLA Phonetics Lab Archive, University of California, Los Angeles, (UCLA) Multimedia Nunggubuyu Vocabulary Audio Lessons (Text, Images & Audio/Sound). Nunggubuyu Literature, Tales, Music, etc. NUNGGUBUYU MYTHS AND ETHNOGRAPHIC TEXTS (1980) - Author: J. Heath; Publisher: Australia Institute of Aboriginal Studies (AIAS) - Name Changed to Australian Institute of Aboriginal and Torres Strait Islander Studies (AIATSIS), Canberra City, Australia, 1980; Printed by: Brown Prior Anderson Pty Ltd, Melbourne, Australia; Department of Linguistics, College of Literature, Science & the Arts, University of Michigan Multimedia Nunggubuyu Myths and Ethnographic Texts - PDF, in 4 Parts, 556 Pages (Text & Images). Browse down to "works on Nunggubuyu (Australia) published by AIAS". Nunggubuyu Animal and Hunting Techniques; etc..."
Official Language of the Nyamal People (Tribe), Marble Bar & Nullagine Towns, Fig Tree Well Project East Pilbara, etc., Western Australia (WA), Australia. Over "5" (Wangka Maya Pilbara Aboriginal Language Centre) Speakers in Australia with more having "...a partial or passive understanding of the language...". "NYAMAL-ENGLISH" "ENGLISH-NYAMAL" - NYAMAL DICTIONARY - Wangka Maya Pilbara Aboriginal Language Centre, South Hedland, Western Australia (WA), Australia Multimedia English <> Nyamal Dictionary - A Language of the Pilbara (Text & Images). Browse Down to the Nyamal and Click on "Interactive e-Dictionary"
Official Language of the Nyangumarta People (Tribe), Various Towns including Anna Plains Station, Marble Bar, Pardoo Station, Port Hedlund, Tjalku Wara, etc., Pilbara Region, Western Australia (WA), Australia. Over "300" (Australian Bureau of Statistics Census - 2006 - Detailed in the "State of Indigenous Cultural Heritage 2011" - Released: December 2011 - Beginning on Page 99 - Department of Sustainability, Environment, Water, Population and Communities, Australian Government) Speakers in Australia. "NYANGUMARTA-ENGLISH" "ENGLISH-NYANGUMARTA" - NYANGUMARTA DICTIONARY - Wangka Maya Pilbara Aboriginal Language Centre, South Hedland, Western Australia (WA), Australia Multimedia English <> Nyangumarta Dictionary - A Language of the Pilbara (Text & Images). Browse Down to the Nyangumarta and Click on "Interactive e-Dictionary"
NYANGUMARTA VACABULARY LESSONS (WAV OR MP3) - Speaker: Elizabeth "Cardboard" Banwarrie, Marble Bar, Port Hedlund & Tjalku Wara, Western Australia (WA), Australia; Recording Location: Warralong, Western Australia (WA), Australia; The UCLA Phonetics Lab Archive, University of California, Los Angeles, (UCLA) Multimedia Nyangumarta Vocabulary Audio Lessons (Text, Images & Audio/Sound). Official Language of the Pitjantjatjara Tribe (Anangu) (People), Various Towns including Amata, Kaltjiti, Mimili, Pukatja, Pipalyatjara, etc., South Australia. Over "2,600" (Australian Bureau of Statistics Census - 2006 - Detailed in the "State of Indigenous Cultural Heritage 2011" - Released: December 2011 - Beginning on Page 99 - Department of Sustainability, Environment, Water, Population and Communities, Australian Government) Speakers in Australia. PITJANTJATJARA VACABULARY LESSONS (WAV OR MP3) - Speaker: Albert, Pitjantjatjara Freehold Lands, Northwest South Australia, Australia; The UCLA Phonetics Lab Archive, University of California, Los Angeles, (UCLA) Multimedia Pitjantjatjara Vocabulary Audio Lessons (Text, Images & Audio/Sound). Pitjantjatjara Vocabulary Audio Lessons (Words & Phrases). Official Language of the Putijarra People (Tribe), Towns of Jigalong, Meekatharra, Newma, Wiluna, Yandeyarra, etc., Western Australia (WA), Australia. Over "5" (Wangka Maya Pilbara Aboriginal Language Centre) Speakers in Australia. "PUTIJARRA-ENGLISH" "ENGLISH-PUTIJARRA" - PUTIJARRA DICTIONARY - Wangka Maya Pilbara Aboriginal Language Centre, South Hedland, Western Australia (WA), Australia Multimedia English <> Putijarra Dictionary - A Language of the Pilbara (Text & Images). Browse Down to the Putijarra and Click on "Dictionary e-Book"
"THALANYJI-ENGLISH" "ENGLISH-THALANYJI" - THALANYJI DICTIONARY - Wangka Maya Pilbara Aboriginal Language Centre, South Hedland, Western Australia (WA), Australia Multimedia English <> Thalanyji Dictionary - A Language of the Pilbara (Text & Images). Browse Down to the Thalanyji and Click on "Interactive e-Dictionary"
Official Language of the Tiwi People (Tribe), Bathurst Island and Melville Island ( Tiwi Land Council), Northern Territory, Australia. Over "1,700" (Australian Bureau of Statistics Census - 2006 - Detailed in the "State of Indigenous Cultural Heritage 2011" - Released: December 2011 - Beginning on Page 99 - Department of Sustainability, Environment, Water, Population and Communities, Australian Government) Speakers in Australia. "ENGLISH-TIWI" "TIWI-ENGLISH" - TIWI-ENGLISH INTERACTIVE DICTIONARY - Compiler: Jenny Lee; Series Editor: Charles E. Grimes; Editor: Maarten Lecompte; Publication: AuSIL Interactive Dictionary Series A-4; Copyright: Australian Society for Indigenous Languages (AuSIL), 2011 Multimedia English <> Tiwi Dictionary - Tiwi-English Interactive Dictionary (Text & Images). "...It is based upon a database setup by Dr. Jennifer R. Lee. A printed version of the dictionary, Nguwurranungurumagi Nginingawila Ngapangiraga: A Tiwi-English Dictionary, compiled by Jennifer Lee, was previously published by the Summer Institute of Linguistics in 1993..."
TIWI VACABULARY LESSONS (WAV OR MP3) - Speaker: Marius Puruntatameri, Bathurst and Melville Islands & Nguiu, Northern Territory, Australia; Recording Location Bachelor, Australia; The UCLA Phonetics Lab Archive, University of California, Los Angeles, (UCLA) Multimedia Tiwi Vocabulary Audio Lessons (Text, Images & Audio/Sound). Tiwi Vocabulary Audio Lessons (Words & Phrases). Official Language of the Uw Oykangand People (Tribe) & Olkola People (Tribe), Cape York Peninsular, Queensland, Australia. Over "100" (Kowanyama Aboriginal Shire Council) Speakers in Australia. "WAGIMAN-ENGLISH" "ENGLISH-WAGIMAN" - WAGIMAN DICTIONARY - Linguists: Stephen Wilson and Mark Harvey; Language Consultants: Lulu Martin Dalpbalngali, Helen Liddy Emorrotjba, Paddy Huddlestone Benbo, Clara McMahon Gumbirtbirtda and Lenny Liddy Gapbuya; Funded & Hosted by the Department of Lintuistics, Faculty of Arts and Social Sciences, University of Sydney, Australia Multimedia English <> Wagiman Dictionary (Text & Images). "...The Wagiman dictionary contains about 1,500 words at present..."
Wagiman Courses, Lessons, Texts, etc. WAGIMAN TEXTS - Stephen Wilson, et.al. ; Funded & Hosted by the Department of Lintuistics, Faculty of Arts and Social Sciences, University of Sydney, Australia Multimedia Wagiman Texts (Text & Images). "...The texts are taken from the book Wakgala mahan matjjin Wagiman: Stories in the Wagiman language of Australia’s Northern Territory..."
Official Language of the Walmajarri People (Tribe), Fitzroy River Valley, Lake Gregory (Mulan), to Bidjadanga on the Coast, Western Australia (WA), Australia. Over "500" (Australian Bureau of Statistics Census - 2006 - Detailed in the "State of Indigenous Cultural Heritage 2011" - Released: December 2011 - Beginning on Page 99 - Department of Sustainability, Environment, Water, Population and Communities, Australian Government) Speakers in Australia. "ENGLISH-WALMAJARRI" "WALMAJARRI-ENGLISH" - WALMAJARRI-ENGLISH INTERACTIVE DICTIONARY - Compilers: Eirlys Richards & Joyce Hudson; Series Editor: Charles E. Grimes; Editor: Maarten Lecompte; Publication: AuSIL Interactive Dictionary Series A-5; Copywright: Australian Society for Indigenous Languages (AuSIL), 2011 Multimedia English <> Walmajarri Dictionary - Walmajarri-English Interactive Dictionary (Text & Images). "...based on the Walmajarri-English dictionary compiled from materials Eirlys Richards and Joyce Hudson gathered in and around Fitzroy Crossing between 1967 and 1984 while working as field linguists..."
"...The Walmajarri speakers represented known dialects of the language. Where they identified words as belonging to a particular region or group, the identification used was shown in brackets after the headword; (E) Eastern, (J) Juwaliny, M (middle), (N) Noonkanbah. The electronic version maintains this identification..."
Official Language of the Warlpiri People (Tribe), Various Towns including Yuendumu, Lajamanu, Willowra, Ali Curung, etc., Tanami Desert Region, Northern Territory, Australia. Over "2,500" (Australian Bureau of Statistics Census - 2006 - Detailed in the "State of Indigenous Cultural Heritage 2011" - Released: December 2011 - Beginning on Page 99 - Department of Sustainability, Environment, Water, Population and Communities, Australian Government) Speakers in Australia. Language Programs for Adults & Children (Warlpiri Youth Development Aboriginal Corporation). "ENGLISH-WARLPIRI" "WARLPIRI-ENGLISH" - INTERACTIVE WARLPIRI-ENGLISH DICTIONARY: WITH ENGLISH-WARLPIRI FINDERLIST - Compiler: Stephen M. Swartz; Series Editor: Charles E. Grimes; Volume Editor: Charles E. Grimes & Maarten Lecompte; Publisher: AuSIL Interactive Dictionary Series B-e; Copywright: Australian Society for Indigenous Languages (AuSIL), 2012 Multimedia English <> Warlpiri Dictionary - Interactive Warlpiri-English Dictionary: With English-Warlpiri Finderlish (2nd Edition) - (Text & Images). "...This dictionary is the result of nearly 20 years of fieldwork by Steve Swartz in the 1980s and 1990s under the auspices of AuSIL (formerly known as SIL-AAIB), and is an update and expansion of his 1997 dictionary..."
WARLPIRI VACABULARY LESSONS (WAV OR MP3) - Speaker: Albert Jangala Gallagher, Yuendumu, Ali Curung Willowra, Alice Springs, Katherine, Darwin, and Lajamanu, Northern Territory, Australia; The UCLA Phonetics Lab Archive, University of California, Los Angeles, (UCLA) Multimedia Warlpiri Vocabulary Audio Lessons (Text, Images & Audio/Sound). Warlpiri Vocabulary Audio Lessons (Words & Phrases). "WARNMAN-ENGLISH" "ENGLISH-WARNMAN" - WARNMAN DICTIONARY - Wangka Maya Pilbara Aboriginal Language Centre, South Hedland, Western Australia (WA), Australia Multimedia English <> Warnman Dictionary - A Language of the Pilbara (Text & Images). Browse Down to the Warnman and Click on "Interactive e-Dictionary"
Official Language of the Wik-Mungkan People (Tribe), Town of Aurukun & on the Cape York Peninsula, Queensland, Australia. "ENGLISH-WIK-MUNGKAN" "WIK-MUNGKAN-ENGLISH" - WIK-MUNGKAN-ENGLISH INTERACTIVE DICTIONARY - Compilers: Christine Kilham, Mabel Pamulkan, Jennifer Pootchemunka & Topsy Wolmby; Series Editor: Charles E. Grimes; Editor: Maarten Lecompte; Publication: AuSIL Interactive Dictionary Series A-6; Copywright: Australian Society for Indigenous Languages (AuSIL), 2011 Multimedia English <> Wik-Mungkan Dictionary - Wik-Mungkan-English Interactive Dictionary (Text & Images). "...published by SIL/AAB as the Dictionary and source book of the Wik-Mungkan language (Kilham. C, 1986)..."
"...The interactive version is based on the printed dictionary and has not been changed or updated, other than to add semantic categories to assist electronic searches..."
WIK-MUNGKAN VACABULARY LESSONS (WAV OR MP3) - Speaker Location: Edward River to Aurukun, Queensland, Australia; The UCLA Phonetics Lab Archive, University of California, Los Angeles, (UCLA) Multimedia Wik-Mungkan Vocabulary Audio Lessons (Text, Images & Audio/Sound). Wik-Mungkan Vocabulary Audio Lessons (Words & Phrases). Official Language of the Yanyuwa People (Tribe), Town of Borroloola, Northern Territory, Australia. Over "120" (Australian Bureau of Statistics Census - 2006 - Detailed in the "State of Indigenous Cultural Heritage 2011" - Released: December 2011 - Beginning on Page 99 - Department of Sustainability, Environment, Water, Population and Communities, Australian Government) Speakers in Australia. "YANYUWA-ENGLISH" "ENGLISH-YANYUWA" - YANYUWA WUKA: LANGUAGE FROM YANYUWA COUNTRY - Authors: John Bradley & Jean Kirton and the Yanyuwa Community; Yanyuwa Texts Collected by: Ken Hale,John Bradley & Jean Kirton, Yanyuwa, Australia; Published: 1992; Hosted by UQ eSpace: The University of Queensland's Institutional Digital Repository, University of Queensland Multimedia Yanyuwa - English - Yanyuwa Dictionary - YANYUWA WUKA: Language from Yanyuwa Country - PDF, 636 Pages (Text & Images). Yanyuwa Nouns, Yanyuwa Adjectives & Yanyuwa Verbs..."
Yanyula Courses, Lessons, etc. - Yanyuwa Courses, Lessons, etc. YANYUWA VACABULARY LESSONS (WAV OR MP3) - Speaker: Timothy Nero, Doomadgee, Northern Territory, Australia; The UCLA Phonetics Lab Archive, University of California, Los Angeles, (UCLA) Multimedia Yanyuwa Vocabulary Audio Lessons (Text, Images & Audio/Sound). Yanyuwa Vocabulary Audio Lessons (Words & Phrases). Official Language of the Yindjibarndi People (Tribe), Town of Roebourne, Pilbara Region, Western Australia (WA), Australia. "YINDJIBARNDI-ENGLISH" "ENGLISH-YINDJIBARNDI" - YINDJIBARNDI DICTIONARY - Wangka Maya Pilbara Aboriginal Language Centre, South Hedland, Western Australia (WA), Australia Multimedia English <> Yindjibarndi Dictionary - A Language of the Pilbara (Text & Images). Browse Down to the Yindjibarndi and Click on "Dictionary e-Book"
YINDJIBARNDI VACABULARY LESSONS (WAV OR MP3) - Speaker: Yilbie Warrie, Roebourne, Woolshed, Western Australia (WA), Australia; The UCLA Phonetics Lab Archive, University of California, Los Angeles, (UCLA) Multimedia Yindjibarndi Vocabulary Audio Lessons (Text, Images & Audio/Sound). Yindjibarndi Vocabulary Audio Lessons (Words & Phrases). Official Language of the Yulparija People (Tribe), Various Towns including Bidyadanga Aboriginal Community (La Grange Mission), Anna Plains, Wallal Downs, Mandoora Stations, etc., Pilbara Region, Western Australia (WA), Australia. Over "15" (Australian Bureau of Statistics Census - 2006 - Detailed in the "State of Indigenous Cultural Heritage 2011" - Released: December 2011 - Beginning on Page 99 - Department of Sustainability, Environment, Water, Population and Communities, Australian Government) Speakers in Australia. "YULPARIJA-ENGLISH" "ENGLISH-YULPARIJA" - YULPARIJA DICTIONARY - Wangka Maya Pilbara Aboriginal Language Centre, South Hedland, Western Australia (WA), Australia Multimedia English <> Yulparija Dictionary - A Language of the Pilbara (Text & Images). Browse Down to the Yulparija and Click on "Interactive e-Dictionary"
AUSTRALIAN ABORIGINAL AND TORRES STRAIT ISLANDER LANGUAGES, HISTORIES, DATABASES, MAPS, ETC. AUSTRALIAN ABORIGINAL LANGUAGES - VIRTUAL LIBRARY - D.R. Nathan, Director, Endangered Languages Archive, The Hans Rausing Endangered Languages Project (HRELP) Multimedia Australian Aboriginal Languages - Virtual Library: Aboriginal and Torres Strait Islander Languages (Text & Images). Dictionaries, Grammar Lessons, Stories, Workshops, Publications; etc..."
AUSTRALIAN BUREAU OF STATISTICS CENSUS - 2006 - DETAILED IN THE "STATE OF INDIGENOUS CULTURAL HERITAGE 2011" Multimedia Australian Bureau of Statistics Census - 2006 - Detailed in the "State of Indigenous Cultural Heritage 2011" - Released: December 2011 - Beginning on Page 99 - Department of Sustainability, Environment, Water, Population and Communities, Australian Government (Text & Images). "...Table 25. Absolute Number of Speakers for a sample of 37 Indigenous languages commonly reported in the 1996, 2001 and 2006 ABS Census..."